In the world of Orthodox blogs, few are as popular as Hirhurim.blogspot.com, run by Rabbi Gil Student. Visited over four million times since its founding five years ago, Hirhurim - which the Jerusalem Post ranked as the "Best Jewish Religion Blog" in 2005 - features informative, intriguing, and sometimes controversial discussions on halacha, Jewish philosophy, biblical stories, and more. Rabbi Student, the managing editor of OU Press and founder of Yashar Books, recently compiled some of his blog posts in book form. Released last month, Posts Along the Way, Vol. 1: Shuls includes 50 short essays on such topics as women rabbis, Carlebach minyanim, and the permissibility of holding one's child duringdavening. The Jewish Press recently spoke with Rabbi Student. 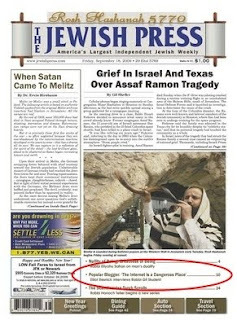 Click here to read moreThe Jewish Press: What inspired you to start your blog in March 2004? Rabbi Student: At the time, there was a Jewish blog discussing homosexuality from a halachic perspective and I didn't feel the sources were being represented accurately. In 2006 the Conservative movement officially issued a permissive ruling on homosexuality. But back in 2004 they were in the discussion stage and a lot of discussion was happening online and via e-mail lists, and it had slowly moved to blogs. I decided to create my own blog to correct what I thought was an incorrect and misleading halachic position on this sensitive topic. Many people views blogs as forums for gossip and criticism of the Orthodox community establishment. What is your take? If you have a hammer, you can use it to build a house or bang someone on the head. It's a tool. It can be used for good or bad. Just as a newspaper can be used for gossip and horrible character assassination - a blog can also. And just like a newspaper can be used to enlighten the community and give it important information - a blog can also. My background is, I think, part of what makes me interesting to people. I went to a Solomon Schechter elementary school - so I have a Conservative upbringing. Then I went to Frisch for high school, a very modern Orthodox school. For college I was in YU, and now I live in the moderate Yeshivish community on the outskirts of Flatbush. So I believe I have a pretty good idea of how all those communities, in general, think about various issues. So when new issues come up, I kind of think about them from various perspectives. It's very hard to pigeonhole me, and I get a lot of criticism for that. Some people think I'm an extreme left-winger, some people think I'm an extreme right-winger, and some people think I'm an extreme centrist. And I just don't think I'm any of them. How did a kid from Solomon Schechter wind up becoming an Orthodox rabbi? I don't really have a story. A person matures and thinks things from a different perspective. I have to do what I think is right, and I'm convinced that where I ended up is the right direction to be going. Is Student your real last name or a penname? It's my real name. Student is a legitimate Polish name that we can trace back to the 1870s; it was not changed at Ellis Island. You gained some notoriety four years ago when, as the president of Yashar Books, you decided to distribute Rabbi Nosson Slifkin's books despite a ban placed upon them by leading haredi rabbis. Can you talk about that controversy? It was a very polarizing debate and the people who opposed my position were very harsh in their condemnations; it was disillusioning and disturbing. I'll give you an example: a personal friend of Rabbi Slifkin started a blog against him criticizing him very harshly - theologically, ideologically and personally. I found it very disturbing that someone who knows so much Torah could be so personally hurtful. Why did you support Rabbi Slifkin? As a religious businessman I contacted various local rabbanim and asked them if they wanted these books available for their communities. I'm a firm believer that p'sak halacha be very specific to the individuals and communities involved. Rabbi Slifkin's books were written for people who have doubts or questions about their faith, particularly regarding so-called contradictions between Torah and science. In his books, he shows how the two can be reconciled. Many rabbis who recognize there are people in their communities who struggle with these issues asked me to make sure that Rabbi Slifkin's books were available in stores to help people, even after - and despite - the ban on the books. Earlier in your career you were involved in defending the Gemara against anti-Semitic charges. Can you talk about this? That must have been about ten years ago. I came across anti-Semitic accusations against the Talmud, which I knew historically had been around for centuries, but I was surprised to see people bringing them back up and posting them on the Internet. I felt it was important that someone should respond to them, so I spent time doing the research and posted a number of responses. To this day I get e-mails about it. How do you respond to people who claim the Gemara requires one mode of behavior vis-à-vis Jews and another vis-à-vis non-Jews? This is something that Rabbi Michael Broyde has written about in law journals - Judaism's approach to people within the legal system and outside of the legal system. For people who are outside the legal system and do not follow halacha, there's a different standard in how you treat them because it's not a reciprocal relationship. The Torah does not demand that you put yourself at a disadvantage because you follow halacha and they don't. Also, I think the general attitude is like a free market: you have to treat everyone fairly but everyone has to take care of themselves. Within your own community, though, you have to treat each other as family, just like if you were running a store you'd give a better discount to your brother than to some stranger off the street. The Jewish people [comprise] one big family. Charging interest [is an example of this]. There's nothing wrong with charging interest. It's standard business practice; there's an opportunity-cost of money. But when you're dealing with family, you give them an interest-free loan. Here and there, though, you hear Jews claiming one can cheat and lie when dealing with non-Jews. I think it's absolutely not true; it's a distortion of the Torah. So why do Jews say this? You're asking me a sociological question. Maybe it's a leftover from Europe when we were persecuted; maybe it's just an inner city mentality of everybody for themselves. You also wrote a book arguing that the Lubavitcher Rebbe cannot be Moshiach. Can you talk about that? I actually prefer not to. People get very offended by it. I wrote the book for ba'alei teshuvah to let them know that there's more than one perspective on the issue. I have no interest in fighting with Lubavitch. I do want to say one thing: The Internet is a dangerous place and just because I'm writing on the Internet doesn't mean that I think it's good for everybody to just go on the Internet. I think it's important for people to use filters and to be careful about what links they click on. We really need to guard ourselves because there is a lot of schmutz out there.